Governor Andrew M. Cuomo today kicked off the Excelsior Scholarship Campaign touring SUNY and CUNY campuses to make college tuition free for middle-class families across New York. At a rally at Buffalo State University with a crowd of over 600 students and local supporters, Western New York leaders including Buffalo Bills Hall of Famer Thurman Thomas, Mayor Brown and County Executive Mark Poloncarz endorsed the Governor’s plan to make college possible for New York families making under $125,000 per year. Approximately 80 percent or 68,712 Western New York families would qualify to attend SUNY or CUNY tuition free under the Governor’s bold proposal. As part of the new campaign, the Governor is also deploying Lieutenant Governor Kathy Hochul and cabinet members to meet with students and faculty at SUNY and CUNY Campuses statewide in support of the first-ever free tuition plan at both two- and four-year colleges. The Governor also announced New York State will host the first ever statewide coding competition for SUNY and CUNY students at all campuses, the "Making College Possible Coding Challenge.” The challenge will encourage students to use technology to share information about the Excelsior Scholarship. The following Western New York leaders have endorsed the Governor’s bold proposal to make college tuition free for middle-class families making up to $125,000 per year in New York State. City of Niagara Falls Councilman Ezra Scott, Jr.
City of Dunkirk Councilman Don Williams, Jr.
"The Empire State is sending a message loud and clear that under the Excelsior Scholarship program students’ dreams of higher education will be realized no matter how much money is in their pocket or the neighborhood they come from." The Excelsior Scholarship program requires participating students to be enrolled at a SUNY or CUNY two- or four-year college full-time. The initiative will cover middle class families and individuals making up to $125,000 through a supplemental aid program. Currently 80 percent of NY households statewide make $125,000 or less with an estimated 940,000 households having college-aged children that would be eligible for the program. The new initiative will be phased in over three years, beginning for New Yorkers making up to $100,000 annually in the fall of 2017, increasing to $110,000 in 2018, and reaching $125,000 in 2019. The Excelsior Scholarship program is designed to provide the most students with the greatest opportunity to attend college tuition free in New York – and that goal is met most cost-effectively by partnering with SUNY and CUNY. The Governor’s program does not treat New York’s private universities unfairly. The state has invested more than $2.4 billion in private schools since 2011, and currently provides grants to approximately 90,000 students to attend private schools. The state of New York’s investment in private colleges is greater than that of any other state besides Texas. Moreover, tuition at New York’s private colleges is much higher than at public institutions – the average tuition for a private school in New York is $34,000 a year compared to roughly $6,400 at SUNY and CUNY four-year schools and $4,300 at our community colleges. Based on enrollment projections, the plan is expected to cost approximately $163 million per year once fully phased in. While the cost estimate of the program is low, that is because it works with already existing programs to close the “last mile” of tuition costs. It combines New York’s already robust $1 billion Tuition Assistance Program with federal grant funding, and then fills in any remaining gaps. The Governor’s program also works by incentivizing students to graduate on-time, requiring students to attend college full-time and graduate with an Associate’s Degree in two years or a Bachelor’s Degree in four years. Graduation rates at New York’s public colleges, while similar to other schools nationwide, are too low – 61 percent of four-year students and 91 percent of our two-year community college students in New York don’t complete their degrees on time. The Excelsior scholarship aims to change that, saving students time and money by reducing their overall debt burden. The plan also recognizes there may be circumstances outside students control, which is why the proposal includes a “stepping out” provision so that students will be able to pause and restart the program if life gets in the way. By 2024, 3.5 million jobs in New York State will require an associate’s degree or higher – roughly 420,000 more jobs than in 2014. But for too many families, the cost of college is currently out of reach. The Excelsior Scholarship will equip students with the skills they need to succeed by making an advanced degree tuition free, and ensure they are able to secure the high-tech, high-paying jobs of tomorrow. The “Making College Possible Coding Challenge” invites student developers and designers from all 64 SUNY and 25 CUNY campuses to build unique digital prototypes inspired by the Excelsior Scholarship around the theme “making college possible.” The prototypes can be for mobile applications or websites, and will be informational tools students can use to learn more about the scholarship and life at SUNY and CUNY. The competition will be conducted in two rounds over the coming weeks, ending with a final judging hosted by Governor Cuomo in New York City. All teams must register by February 14th, after which an official prompt will be sent to all registered teams. The preliminary judging will take place in late February, and the top five entrants will move on to the final judging and pitch session, to take place in early March. The top five teams will work with mentors from New York’s technology community and pitch their final products to a judging panel that will select one winner. The winning submission will be used to promote the Excelsior Scholarship. To register for the challenge, and to learn more, visit the Making College Possible website. Thurman and Patti Thomas said, "New York is a beacon of hope to working class people across the state and a model for the nation to follow. Through the Governor’s unprecedented initiatives and proposals that vow to protect and expand opportunity for men, women and their families, this administration has truly gone above and beyond what state government has ever done for the people of this state. The new Excelsior Scholarship takes these efforts even further, making a world-class college education attainable for some of New York’s most deserving young minds who would otherwise not have the means to attend college. I commend Governor Cuomo for providing our students with the resources and tools needed to succeed." Buffalo State President Katherine Conway-Turner said, “We at Buffalo State applaud the vision that underscores Governor Cuomo’s proposed Excelsior Scholarship program. Buffalo State and our sister campuses provide transformative learning experiences for students from all socio-economic and cultural backgrounds. We are keenly aware of the power of a college degree to advance social mobility and transform the lives of students and their families. Many students across the state struggle to complete degrees due to economic pressures and Governor Cuomo’s free tuition plan will provide more New Yorkers with a path to a brighter future." Dr. Kriner Cash, Superintendent, Buffalo Public Schools, said, "Education beyond high school is a must for young people in this highly competitive global economy. Investment in college education strengthens our city as it undergoes a full transformational renaissance at every level of government, business, the arts, and education. Governor Cuomo’s plan to offer free tuition at state and city schools sets the bar high for states across the nation to follow suit while working to close the financial gap for all families who need assistance." SUNY Fredonia President Virginia Horvath said, "New York is home to some of the best public institutions of higher learning in the country, and Governor Cuomo’s new Excelsior Scholarships Program will open their doors to all New Yorkers. The Governor’s proposal represents a major development in public education and sets a precedent that other states are bound to follow. I look forward to a day when universal higher education is as normal as public high school, and New Yorkers will be able to say, ‘we were the first.’"
City of Buffalo Mayor Brown said, "With our economy shifting toward the high-tech manufacturing sectors, it is critical that we help our students receive a college education so that they can be competitive in tomorrow's workforce. Governor Cuomo's Excelsior Scholarship Program offers a real solution to the college affordability crisis and will ensure that our workforce remains on the cutting-edge of industry developments, while helping our young New Yorkers find a good-paying job and get ahead at such an important time in their lives. I am proud to join this campaign and encourage our state leaders to make this a reality so that we can make college possible for more young New Yorkers." Erie County Executive Mark Poloncarz said, "A college education is critically important to remain competitive in today's economy, but as tuition costs continue to skyrocket out of control, far too many students and families are breaking the bank just get a college degree. Thankfully, Governor Cuomo has put forth a sensible plan that will offer all students, regardless of their financial background the chance to succeed. 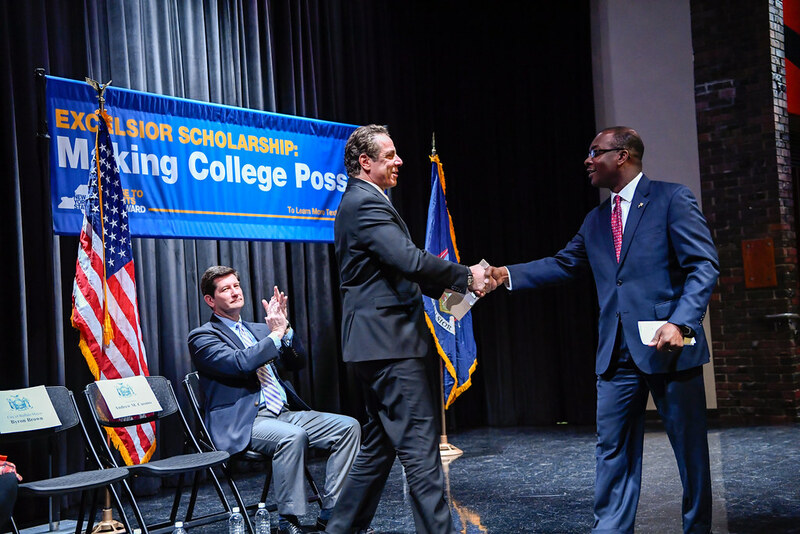 The Excelsior Scholarship has the potential to make a difference in thousands of families' lives in the Western New York Community and across the state and I thank Governor Cuomo for once again helping our middle class move forward." City of Niagara Falls Mayor Paul Dyster said, "In New York, our premier universities like SUNY Buffalo offer countless academic and research programs for our next generation of professionals, but far too many of these remain out of reach for too many young people. Governor Cuomo’s Excelsior Scholarship is seeking to reverse this troubling trend by offering freeý college tuition at our state universities so that students can get back on their feet after graduation instead of facing decades of mounting debtý. Through programs like the coding challenge, this state is spotlighting the important role technology and higher education plays in growing our 21stcentury workforce. This scholarship program will us remain competitive in the global economy for generations to come and I thank Governor Cuomo for leading the way forward." City of Dunkirk Mayor Willie Rosas said, "The Governor's Excelsior Scholarship proposal marks a milestone victory for working- and middle-class families across New York, and especially in the City of Dunkirk. By providing strivers with access to the skills they need to succeed in the global economy, we are setting generations of New Yorkers up for success. I commend the Governor on this smart, forward-thinking plan which will make a college degree tuition free for hundreds of thousands of students, and I urge the Legislature to swiftly enact this new measure." City of Salamanca Mayor Michael Smith, "Today the higher education system is rigged against our state and nation's hard-working middle class families -- with tuition continuing to skyrocket and mounting student debt following New Yorkers for decades after graduation. Thankfully, Governor Cuomo has put forward a smart, innovative plan to change that. By making college tuition free for middle-class families making under $125,000 per year, the Governor will help alleviate the heavy burden of debt and provide more strivers with the opportunity to obtain the skills they need to succeed. I commend Governor Cuomo on his leadership, and urge the State Legislature to pass this important plan this session." Village of Fredonia Mayor Athanasia Landis said, "In today’s competitive business climate, education does not stop with a high school diploma. A college education is essential to gaining the experience needed to start a career and join the ranks of the middle class. This Governor’s Excelsior Scholarship will transform the way we see college, making it more affordable and more realistic for so many New Yorkers. Some of our brightest minds have been waiting for this day for a long time, and thanks to the Governor, they know have a chance to work toward a degree and succeed." City of Dunkirk Councilman Don Williams, Jr. said, "Governor Cuomo’s plan to cover tuition costs at state universities is a boon for all New Yorkers. College graduates are more likely to advance innovation, conduct groundbreaking research, and start companies that create jobs. So when more students go to college, everyone benefits. I have no doubt that the Excelsior Scholarships Program will help advance economic growth and attract new businesses and more jobs to New York. Thanks to Governor Cuomo’s leadership and foresight, New York is on the right track." Cattaraugus County Legislator Susan Labuhn said, "A college education is equivalent to what was once a high school diploma, leaving millions of New Yorkers lagging behind in the competitive global economy due to the astronomical costs of higher education. By providing so many men and women the chance at achieving the American Dream, Governor Cuomo will not only change the lives of families across the state, this Excelsior Scholarship will open doors for students everywhere. We thank Governor Cuomo for championing this landmark proposal and for bringing opportunity to the doorsteps of so many middle class families." Pastor George Nicholas, Lincoln Memorial United Methodist Church, said, In the 21st century economy, a college degree is the key to success. And yet too many young people today cannot afford to go to college or are forced to take on overwhelming student debt to finish their degree. By making public universities tuition-free, Governor Cuomo’s initiative will provide young people across New York, regardless of their economic situation, the key to unlock their God-given potential and secure a better future for themselves and their families. This is a relatively low cost program that will pay dividends for generations to come.